Here’s a pretty easy DIY project, for someone so inclined. I’ll be honest, after checking around a bit on the price of commercial teflon mouse pads, I’m not sure why you’d want to take the time to make one. Essentially the project is this: take a teflon surface like a cookie sheet, baking pan, or skillet, and then modify it to the right size, and then finish the edges so you don’t injure yourself. The part that I have trouble with is the price. 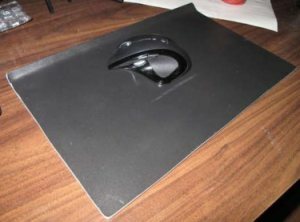 Searching around on the web, I found teflon coated mouse pads for under $25. The price of the two burned griddle that the creator of this project purchased was $25. He then took the time to cut the metal, file it down, and then sand it to a fine polish. To me, well.. my time is worth more than the satisfaction of knowing that I made my own mouse pad. If you want instructions on how to do this project, click here.